Thread: Strange behaviour - for the Birders. 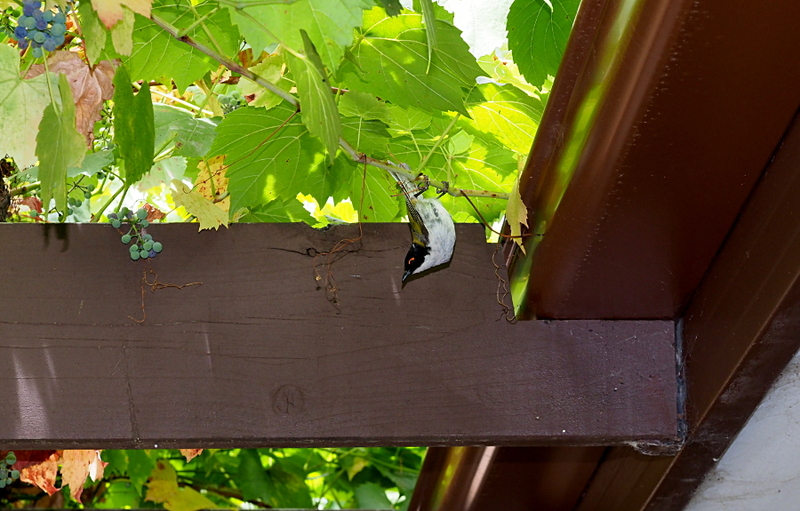 Came home from shopping to find this little White-naped Honeyeater lying on a glass table underneath our vine-covered pergola. Eyes shut, and obviously had flown into the window above the table. It was very still, but breathing, so I adopted a "wait & see" policy and did not touch it. After several long minutes it moved, then righted itself and sat for another few minutes before flying up into the vine. The surprising thing was that it perched quite normally for another few minutes and then dropped into the position in the photo. It stayed there long enough for me to get the camera, take a shot, and watch it for a good 10 minutes, when it righted itself to a normal perch position. Eventually I decided it must be OK and took the camera inside. On returning, it had gone, hopefully recovered. I am surmising that the upside-down bit was disorientation? Or perhaps wise enough to think that blood running to the head aided recovery? Good to see that the Bird is ok now Lyn, poor little thing. Seen lots of those happenings and more than half with broken necks so that's a great news. Ornamental grapevine planted for autumn colour- throws up a few grapes which the blackbirds enjoy. Was the bird in the sun before assuming this position Lyn? I imagine it is simply the less stressful position the bird was comfortable with as it finished it's recovery. Up-side down is quite natural for many birds. Like the story and you did the right thing leaving the bird alone. Somehow it grates on our immediate impulse to help though. No Mark- the table was in the shade under the vines. You are probably right in your assumption that it was happier upside-down. Perhaps it took more energy to hold itself upright and it was easier to hang on upside-down with the claws. I know cockatoos, galahs etc love hanging upside down, but I was a little surprised to see a Honeyeater do it. ... but I was a little surprised to see a Honeyeater do it. Honeyeaters and lorkeets are used to hanging that way as it helps them get that nectar from flowers. It was interesting. Thanks for commenting Marty.